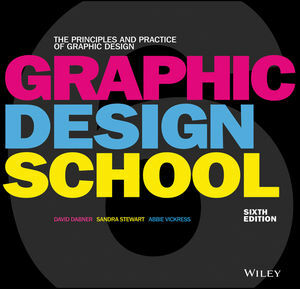 Graphic Design School provides a comprehensive introduction to visual design for modern media. From the fundamentals of design to advanced techniques and problem solving, this book is packed with practical advice and tutorials for a broad range of applications in any media. This updated sixth edition features a wealth of new guidance that reflects the evolution of the field, including extensive discussion of digital design and resourcing. New discussion tackles User Experience and User Interface Design, plus the latest tools, requirements, and resources for designing for the web, mobile apps, social media, and more. Updated assignments reflect the latest graphic design processes and guide students through the transition from simple solutions to starter portfolio pieces, while full-color illustrations, case studies, and designer biographies bring real-world perspective to this complex, multi-faceted skill. As media continues to evolve, graphic designers must possess a core set of competencies that translate across all applications. This book teaches the critical concepts and essential skills that build the framework for successful, innovative design. Graphic design has never been a static field, and the continual honing of skills and techniques is an essential part of the job. Innovation comes from change, and today's design landscape is evolving at an ever-increasing pace—expanding diversity in media, audience, topic, technique, tools, and more offer unprecedented opportunity to make your mark. Graphic Design School equips you with a rock-solid foundation to support whatever your talent builds. Abbie Vickress is a lecturer teaching at Buckinghamshire New University (in the UK) on the undergraduate Graphic Arts programme and at London's Royal College of Art on the postgraduate Visual Communications programme. She is also a freelance graphic designer. Abbie specialises in socially and politically engaged research and topics using a range of graphic mediums including print and e-books, websites, social media, films exhibitions and conferences. Sandra Stewart is the Associate Dean for Academics at Drexel University's Westphal College of Media & Arts Design.